Logement insolite, confortable, propre et petit déjeuner très sympa. L’emplacement est excellent. Super accrobranche avec des tyroliennes traversant le doubs. Une superbe nuit dans la nature. C était le pire anniversaire de ma vie. Sanitaire insalubre et proprio de mauvaise foi. J avais partager mon mauvais expérience sur fb. Instants magiques dans un lieu magique suspendu avec le Doubs s'écoulant paisiblement en contrebas. Accueil à la fois pro et très sympathique. Das Frühstück im Weidenkorb per Seilzug direkt auf den Tisch geliefert war ein ganz besonders schönes Erlebnis. Die Plattform im Baum über dem Doubs, das runde Bett mit direktem Blick in den Sternenhimmelund das herrliche Outddorleben waren ein besonderer Genuss! nicht alltägliches kleines Abenteuer. Dusche, Toilette , Tisch , Stühle und 2 Liegen alles auf dem Baum ! Das Bett war groß genug für uns zwei und es gab keinerlei Moskito - Belästigung . Der Sternenhimmel nachts war beeindruckend ! Tolle Lage am Doubs ! Le cadre est splendide, le calme assuré, une excellente nuit entourés par les oiseaux et les poissons ! Super accueil ! Offering lake views, Bulles Acro Isis is located in Dole and provides an unusual accommodations set among the trees. Isis Aquatic Park is just 350 feet from the property. 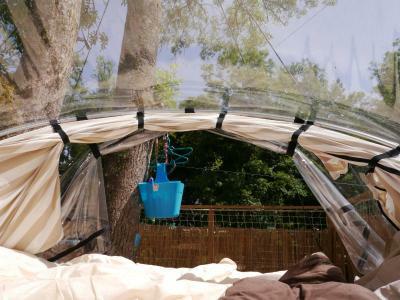 Set at 20 feet of height on a terrace with outdoor furniture, the tent features a river view, a private entrance and a mosquito net. It also comes with a shower and a dry toilet. Breakfast is included in the rate and delivered to your accommodations. Packed lunches are also available upon request. An array of activities can be enjoyed in the surroundings, including cycling, hiking and canoeing. The property offers free private parking on site. When would you like to stay at Bulles Acro Isis? House Rules Bulles Acro Isis takes special requests – add in the next step! Bulles Acro Isis accepts these cards and reserves the right to temporarily hold an amount prior to arrival. Please inform Bulles Acro Isis of your expected arrival time in advance. You can use the Special Requests box when booking, or contact the property directly using the contact details in your confirmation.